Barbie finally had her much anticipated runway show at New York Fashion Week last Saturday! The show consisted of 51 models (including 1 Ken) strutting Barbie’s iconic Past, Present and Future styled designs by 50 top designers and ended with a highly celebratory finale moment with 50 cute little girls in cute little frocks. The makeup team consisted of 26 beauty pros from Stila headed by Charlotte Tilbury while the hair and nails were created by Orlanda Pita for T3 and CND, respectively. Just like the clothes, there were 3 different looks – past, present and future. The eyes were the focus in all 3 looks and all models on the show wore fake lashes. Barbie of the past was taken from the original 1959 Barbie doll. “The past is a little bit of a 50s cat eye, pillowbox red lip, that late 50s early 60s red lip with silver highlights on the face, a little bit contoured”, said Tilbury. Stila Strawberry Lip Glaze, Sun Bronzer, Dominique Lipstick and Liquid Eyeliner were used to create the look. The hair was a classic high ponytail with bangs while nails were a gorgeous red (CND Wildfire). The present Barbie is simply the uber girly and pretty Barbie that we are all familiar with, like a doll version of Sharon Tate. She has glowy skin, big Bambi eyes with lots of lilacs and light pinks, big, voluminous hair and hot pink nails. The look is fresh, super wearable and fun. Products used included Stila Illuminating Liquid Foundation, All Over Shimmer, the upcoming Giggle Lip Vinyl and CND Hot Pop Pink. 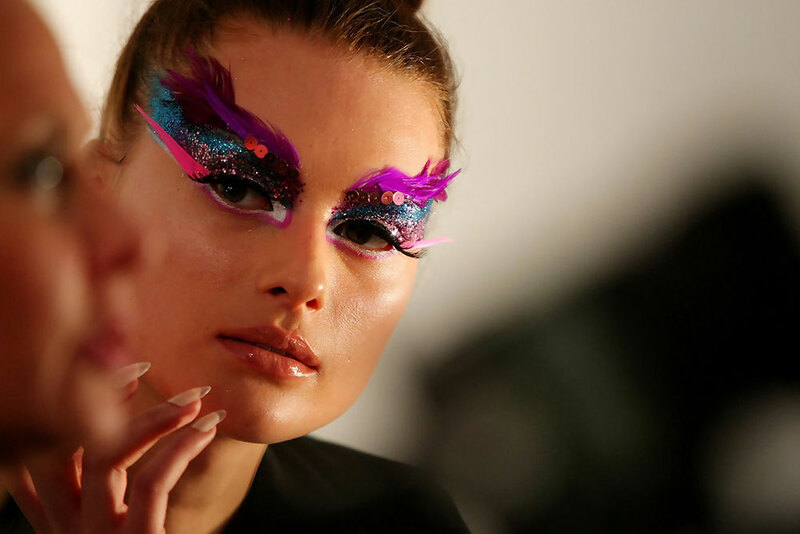 For the future, it is all about a “wild and crazy” Barbie so Tilbury created a bright, masquerade look with feathers, gemstones, rhinestones and sequins while Pita gave models a high bun with side bangs and braids. Colors like pinks, blues, teals and purples were used around the eyes (Stila Glitter Eye Liner in Purple Silver, Purple Pink and Green Gold) and to balance things out, the skin is left clean with a soft beigey glossy lip and a contoured cheek. Nails were painted a custom blend of CND Negligee and Serenity, layered over each other. Images: ImaxTree and Andrew H. Walker/Getty Images North America. and the models are gorgeous! Thanks for putting info about the nails. I’m just getting into fake nails myself, and they look so much better than real ones (way easier, too). Thank you for some additional peeks at Babie’s first runway event. Regards.